Currently these have not been back checked with the current patch that is out. I have not patched yet out of fear of my saved game. I've had a lot of bad experiences patching Bethesda games and not having my save work anymore. Some of these have screenshots. Sometimes the game freezes when re-entering the game from an alt-tab. The game is still responsive until you click a menu object. Sometimes while in a house with a NPC on the above floor, the shadow will appear on the floor on your floor as the NPC moves. May or may not be only an issue with HDR lighting. Garrus Darellium still mentions to find Aldos even after you tell him the news of his death after you leave the speech dialog with him. People are still talking about the Grey Wolf's capture even after he was captured and unmasked. The quest message that you receive when you find Weatherleah does not correspond with actually finding it. To get the actual find message, you have to be in front of the house. Even once Dar-Ma returns and her mother thanks you the quest does not end sometimes. I did some other quests then went back to that one and she finally ended the quest. Seridur dies sometimes without any interaction from you at all before you even get to his room. I believe this is because certain monsters that spawn will fight and kill him. I believe this happened with a Dread Zombie. Sometimes while entering certain shops or houses objects seem to shift in place. In some instances objects fall off the shelves as you enter. Objects not placed properly and physics throwing them around? Sometimes while removing an object from a surface will shift everything else on the table, even if it wasn't connected in any way. The "brush jar" object has very loopy physics. Try to pick it up, and drop it in certain manners. It will constantly keep tipping back and forth forever. Most placed items look as if they are hovering in the air above the surface they are resting on? Vlanhonder Moslin of Hackdirt still sells beds even if he is not actually in his inn. Engaging in another dialogue while another NPC is idly talking (not in dialogue) will stop the sound, even after you are out of the dialogue, although that NPCs lips will still be moving even though the audio was stopped. Dorian in the Imperial Plaza District has infinite gold when killed and looted. See this bug in action (with video) on the Money Glitch page. Sometimes enemies are unresponsive to hostile magic attacks. They seem frozen while they continue to take damage from spells. This happened to me with an ogre once, and he looped a taunt gesture while he stood there taking fireballs. 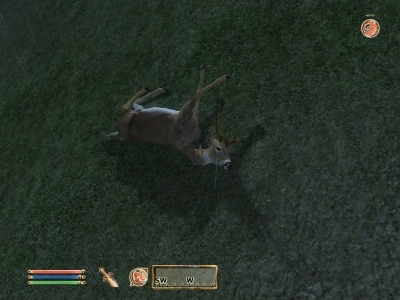 A deer also stood there and took me shooting arrows into him. Sometimes while loading a game during a spell effect on your loaded game your character will still be colored from that effect permanently until you cast a magic spell to remove it. You have to cast a magic spell both in first person and in third person to fully remove it, as it seems to effect both views separately. There is a bug with not custom naming potions, as a result some of your potions will be named incorrectly for some reason. This happened when I made a feather potion, and in my inventory it was called a "Restore Magicka" potion, even though it only had a feather effect. Deer do not have certain parts of their skeletal structure locked in place. Their neck bends in all ways. This is also an issue with lions. Sometimes the wall trap in dungeons (walls go up and down) will push you into the ceiling and you will be able to walk above and partially inside the ceiling. This happened to me inside Narfindel. Part of the stair structure is poking through the wall in the dinning area in Chorol castle (and possibly other castles with the same design). Garlic and lockpicks weight 0? 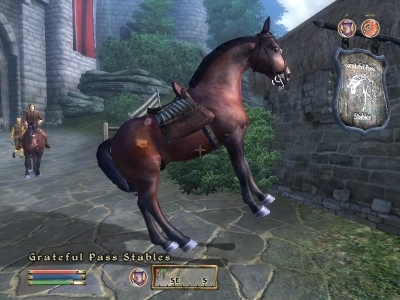 Horses sometimes angle upwards in the air for unknown reasons. 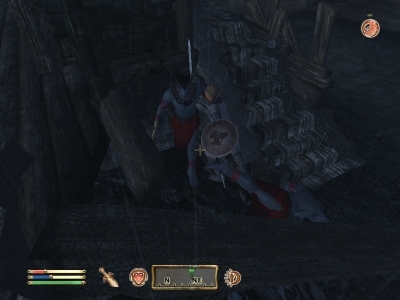 There is many "stuck" areas located in the first part of Kvatch. One area allows no monsters to get through except the captain, and then once the captain goes in there he will not be able to get out. There is also another area where monsters can get stuck and never get out, once again, the captain goes in this spot sometimes and gets stuck. Wraith death animation sometimes freezes if you open the corpse up immediately after death. The Wraith body will remain in the air. Orcish shields have a weird dropping sound. I believe it is a jewelry or glass dropping sound. You can duplicate any item in the game by trying to equip arrows while already drawing an arrow into your bow and going into your inventory. After trying to re-equip your arrows drop an item from your inventory. That item will be duplicated on the ground as many times as the amount of arrows you tried to equip. You can see this in action (with video) on the Duplicate Glitch page.